July 14 is National Mac and Cheese Day. Did you know there was a National Mac and Cheese Day? I didn’t, but what a delicious comfort food to celebrate – especially for those Preggers mamas. Is anyone out there craving Mac and Cheese? Below are some scrumptious recipes to help satisfy those cravings. Make some now and enjoy OR save it for National Mac and Cheese Day! Bring a pot of salted water to a boil; add the pasta and cook until al dente. Reserve 1 cup cooking water, then drain the pasta. Preheat oven to 400 degrees F.
Meanwhile, melt the butter in a large saucepan over medium heat. Whisk in the flour and cook, whisking, 2 minutes, then whisk in the milk. Add the bay leaf, nutmeg and 1 teaspoon salt and simmer, whisking occasionally, until thick, 8 minutes. Remove the bay leaf and stir in 2 cups cheddar and the gruyere. Stir in the pasta and the reserved cooking water to make a loose sauce. Butter a 2-quart baking dish; add the pasta mixture and top with the remaining ½ cup cheddar. Bake 15 minutes. So, that’s a classic baked Mac and Cheese, but sometimes you want something a little more reminiscent of your childhood. So, here is an American Mac and Cheese recipe. Bring a pot of salted water to a boil; add the pasta and cook until al dente. Reserve 1 cup cooking water, then drain the pasta. Meanwhile, melt the butter in a medium saucepan over medium heat; whisk in the flour, mustard powder and cayenne and cook, whisking, 1 minute. Whisk in the evaporated milk and simmer, stirring occasionally, until slightly thick, about 5 minutes. Stir in the cheeses, then the pasta and just enough of the reserved cooking water to make a thick sauce. Season with salt and black pepper. The website www.foodnetwork .com/recipes/articles/50-mac-and-cheese-recipes takes these two basic recipes and details how to jazz them up a little bit. With varieties including French Style, Barbecue Style and Bacon Chipotle, there’s really something for most tastes. These sound delicious and I truly love Mac and Cheese. I’ve kind become a Mac and Cheese snob of sorts. I prefer unique and delicious additions to your typical Mac and Cheese. 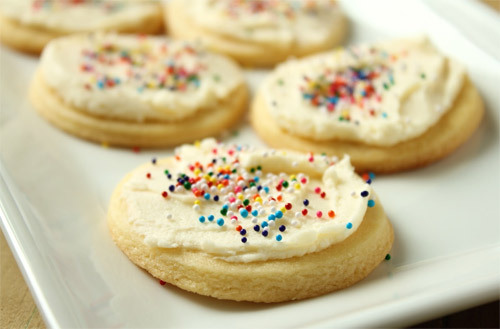 This recipe from www.delish.com is my absolute favorite! Preheat oven to 350 degrees F. Melt 2 tablespoons of butter and heat olive oil in a medium skillet over medium high heat. Add onion and sauté until tender, about 5 minutes. Add cornbread crumbles, stir to combine, and remove from heat. Set aside. To prepare macaroni and cheese, begin by bringing a large pot of salted water to boil. Add noodles and cook according to package directions for al dente. Drain well and set aside. In a medium saucepan, melt remaining ¼ cup of butter over medium heat. Add flour and cook about 2 minutes or until rue is golden. Slowly whisk in half-and-half and milk; stir until mixture has thickened and slightly darkened, about 3 minutes. Season with the salt, pepper, and cinnamon. Slowly add grated sharp cheddar cheese, a little at a time, and stir until completely melted. Remove pan from heat. Mix in reserved noodles and apples. Stir until well combined. Pour pasta mixture into a greased 2 ½ quart casserole dish and top with reserved cornbread mixture. Bake 30 to 35 minutes or until bubbly, and golden on top. Remove from oven and allow to cool 10 minutes. Serve warm. Yum! Delicious! Make some now and freeze it to save for after the baby is born. 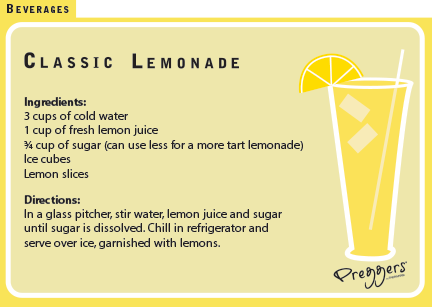 How about a refreshing lemonade drink that is perfect for those summer baby showers!! 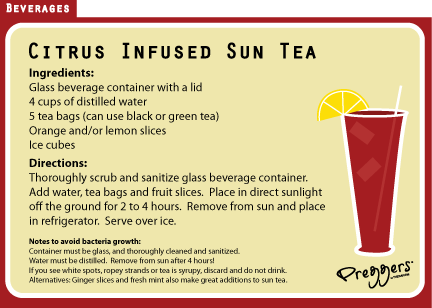 Have your shower hostess prepare a punch bowl of this delicious concoction. Add a little blue food coloring to “blue” it up if you need. This recipe has all the refreshing mint and lime flavors of a mojito, but with delicious fresh blueberries added. And it’s pretty to boot! You really can’t go wrong with this drink. 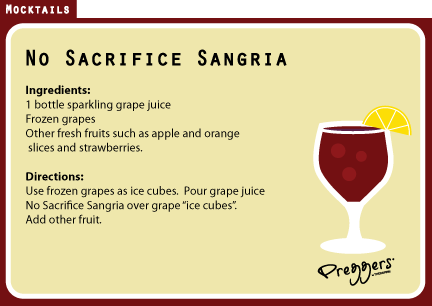 For a mojito mocktail without the blueberry, try this one out. With the delicious lime and mint flavors you won’t even miss the rum! In our family, we love brunch showers. Mimosas are the perfect brunch accompaniment. 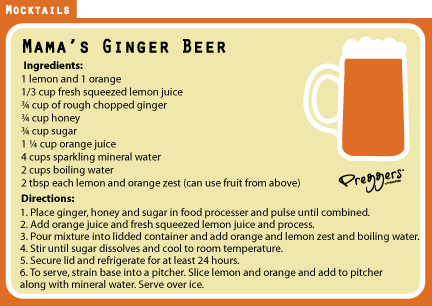 But since mama will need a baby-friendly one, you can try this recipe. Pureed strawberries really brighten up the look and flavor of this drink. This double delicious dessert mocktail should satisfy some of those pregnancy cravings!! Who needs the liquor when you have a drink made with mint chocolate chip ice cream?! 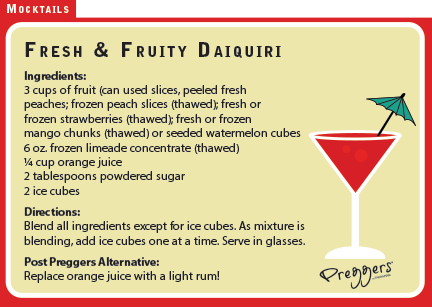 You should be set for the summer with this delicious mocktails. But, if you need more possibilities, check out our previous blog on the subject! Don’t forget to drink plenty of water, too! Summer is HERE, Preggers mamas. And with summer comes a few inevitable challenges for the pregnant among us. As everyone – especially pregnant mothers – is expected to drink lots of water to keep hydrated, we’d like to take this moment to encourage you to drink up! Water that is. But, if you’re like me, water gets pretty boring after a while. 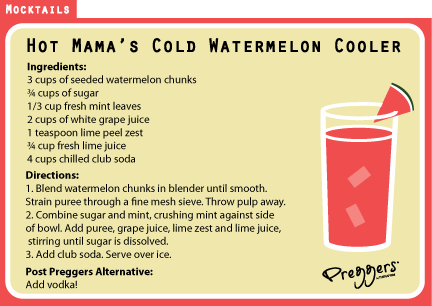 So, when you’ve had your fill of the H2O, let Preggers come to your rescue with a few recipes for some summertime cool down drinks that are oh so safe for your growing munchkin! 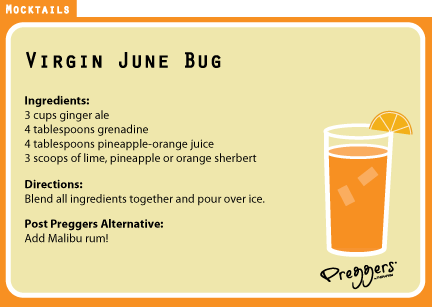 When it comes time to enjoy your favorite summertime cocktail, try these tasty Preggers “Mocktails” instead. 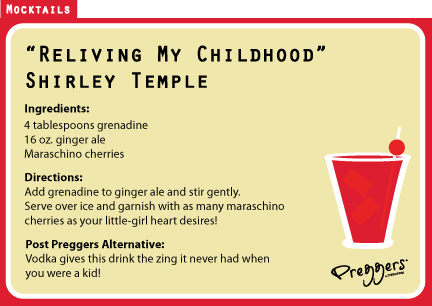 These fun and refreshing beverages are like the grownup versions you’re used to, but without that shall we say “forbidden fruit” that you need to avoid right now. Alas, sometimes you just want that certain off-limits beverage, like a cold summer beer or a glass of champagne at the endless parade of summer weddings. Here are a few substitutes that are almost as good as the real thing! Remember, Preggers Mamas, drinking plenty of water is always best for you and baby. But, when you need a little extra, try one of our delicious recipes! Bottoms Up and Cheers from the Preggers team! Easy Chicken Enchiladas – Great for Freezing! Sharing this fantastic recipe for Easy Chicken Enchiladas – easy to make, tastes great, and makes a great freezer meal for post-baby! I plan on making several for after baby #2 🙂 Enjoy & be sure to share your recipes in the comments! Put chicken breasts, cream cheese, rotel and green chilies in slow cooker. Cook on low for 4-6 hours until chicken is tender. Shred the chicken in the slow cooker (it should shred up pretty easily with just a fork). Sprinkle with Monterey Jack cheese, and drizzle with whipping cream. Cover with foil and bake at 350 degrees for 30 min. Take off foil and cook for another 15 mins, or until top is golden brown. Serve with your favorite taco topping: black beans, lettuce, tomato, sour cream, onion, guacamole…..whatever you desire! What’s your favorite freezer recipe? Oatmeal – Do your best to get something in you before you head out the door in the morning! Breakfast is like fueling up your vehicle for the day – it is a must. Oatmeal is great for its long-lasting combo-fuel of fiber and complex carbs. The vitamin B in oatmeal also helps with energy. Back to my point about sugar – watch out for flavored oatmeal as it can have a bit too much sugar. Use natural sweeteners on regular oatmeal instead like brown sugar, honey or fruit. Almonds – Just a small handful of almonds pack a great energy boost. Not ideal for a meal but great for your “I’m starving” moments throughout the day. They contain the good kind of fats to keep you going plus calcium, protein, zinc & iron. Lean meats – Choose lean red meats if possible for the greatest source of protein, zinc, vitamins and iron. Yogurt – What a fantastic source of healthy, energy producing protein, calcium and magnesium! Another warning about the flavored options here – look for the non-flavored options on the lower shelves and add your own honey or fresh fruit as a sweetener. Bananas – besides helping with leg cramping, bananas are also a great source of energy. Their potassium, fiber, and vitamins prove more filling than most fruits. Some other energy-packed foods include lentil beans, dark chocolate, peanut butter, brown rice, multi-grain bread, pumpkin seeds, oranges, apples, spinach, black beans, eggs, broccoli and sweet potatoes. Besides food, exercising, a good night’s sleep and compression stockings (check out Preggers) are great ways to boost energy during pregnancy. What else has kept your energy up throughout pregnancy? *This is only general information and is not meant for the diagnosis or treatment of any medical conditions. Always consult your physician or other health care provider about all health concerns, conditions, and recommended treatments. First, we must roast the butternut squash. I prefer to cut them in half the long way, scoop out the seeds, brush with olive oil/garlic and then roast at 400° flesh down in a pan with about an inch of water for about 25 minutes or until fork tender. You can find any roasting recipe and use that as well. Peel and cube the squash after roasting and set aside. In a large saucepan, saute onions in margarine until tender. Add squash, water, bouillon, marjoram, black pepper and cayenne pepper. Bring to boil; cook 5 minutes. Puree squash and cream cheese in a blender or food processor in batches until smooth. Return to saucepan if the soup needs to heat through but do not allow to boil. What’s your favorite healthy(ish) soup recipe?